It seems the phrase "Dream big, little one" comes on just about anything you can imagine. It’s left me wondering, where are the “Dream big, Mama” signs? We can’t expect kids to do things (be kind, say please, eat vegetables) that we don’t model ourselves. Yet one thing I’ve been (mostly subtly) reminded after becoming a mom is that I should quit all this dreaming big nonsense. Others are not at all surprised I’d want to get back to running or try to make the Trials. But when I say how much I’m already running and that I want to race soon, I feel the need to temper it. “I’d like to run a marathon this fall,” I say. Then I quickly add, “But I’ll drop to the half if I need to, if that’s not realistic.” Because people give me a look like it’s not realistic. (Note: I know of both pros and amateurs who have PR-ed 7-9 months post-baby. And I’m not trying to PR, I’m just trying to race again.) I know they mean well; they are afraid I’ll hurt myself or become too overwhelmed. They’d rather I’d relax about it and take my time. (1) Like everything about pregnancy/postpartum/parenting/life, everyone is different. Some runners come back quickly, some take their time. There are reasons for both approaches and all that matters is you do what works for you and your family. (2) I realize the injury risk and I’m increasing my mileage and training load carefully, focusing on eating right, and (trying!) to sleep as much as possible. 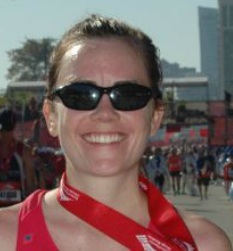 (3) Running helps me be a better, happier, less anxious Mom and reminds me that I’m still me, even with this new role. And, for me, the fun of running lies in challenging myself and training for races, so that’s what I’m going to do. Being a parent requires sacrifices, absolutely. But I don’t think you should stop being yourself and pursuing healthy hobbies and passions. If you can find a way to chase your dreams that works for your family, then you should. Your kids will get a lot out of watching the pursuit: the work you put in and how you deal with both the failures and the successes. So the short version is: Yes, I’m running again. Yes, I’m training for a marathon this fall. And yes, I'm racing soon... as in, on Sunday.